A team from Southern Cross University (SCU) and the Queensland University of Technology (QUT) is working on a way to improve the coral spawn on the Great Barrier Reef using robotics and larval clouds. Devices will be deployed on the Great Barrier Reef for the first time in November. The research team will capture hundreds of millions of coral spawn from the heat tolerant corals that have survived the two recent mass coral bleachings, and rear them into baby corals in mass quantities inside large floating enclosures at sea. 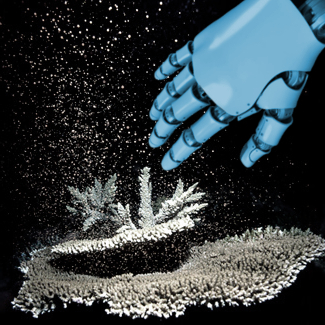 A new generation of robot will then play ‘stork’, delivering the tiny baby coral larvae out onto reefs for settlement on damaged northern Great Barrier Reef areas. This new upscaling approach will allow up to a 100-times increase in the number of coral larvae produced as well as better targeting to settle them onto the reefs that most need them. The project builds on SCU Professor Peter Harrison’s eight successful reef projects that successfully demonstrated small-scale spawn slick capture and coral larval enhancement to create new coral populations. The team hopes it will result in a much-needed boost to restore coral reefs on a large scale and speed up the recovery of ecosystems that have been hard hit by coral bleaching and other impacts. Key to this innovation are newly designed, large-scale mega spawn-catchers and solar powered floating larval incubation pools on reefs that have been designed to rear hundreds of millions of genetically diverse thermally-tolerant coral larvae for settlement on damaged reefs. The will distribute millions of larvae as larval clouds on damaged reef areas, and in targeted reef habitats using a new LarvalBot semi-autonomous underwater larval delivery vehicle. The project will be enabled through $300,000 in funding from winning the Great Barrier Reef Foundation’s Out of the Blue Box Reef Innovation Challenge, supported by The Tiffany & Co. Foundation.